In case anyone is wondering why I haven’t posted in a while, I thought I’d explain. I’m going to be exhibiting some of my creations at Vancouver Mini Maker Faire in a couple weeks, and I’ve been frantically trying to get everything in order before then. I realized a couple weeks ago that I’m not going to have Yoda done, so I’ll just be demonstrating whatever part of him is working at the time. In the meantime, I’ve been busy with all the ancillaries that didn’t occur to me when I signed up for Maker Faire. Things like business cards, and signage. Creating business card meant first creating my logo, however. Thankfully I already had an idea in mind, and I think it turned out quite well. 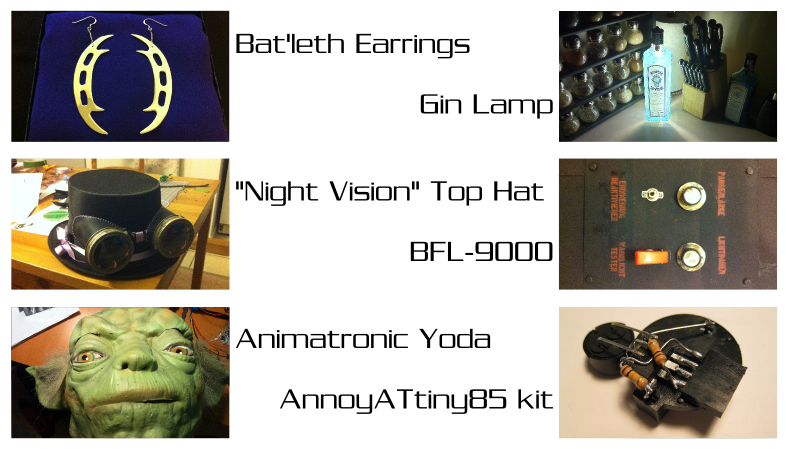 I’ve also put a lot of work into getting instructions and information ready for the AnnoyATtiny85 kits I created. I’ve finally got labels and business cards sent off for printing, so now I need to concentrate on signage. I would also still like to get the parts of Yoda that are working on their own actually integrated so they work together. Anyway, in the meantime, here are the front and back of the business cards.